I first met Rick Tomaska (virtually, through email and phone conversations) in the early weeks of 2005, not long after I came aboard as publisher at Whitman Publishing. Editorial work was under way on the 59th edition of the Guide Book of United States Coins (the hobby’s popular “Red Book”), and Rick shared his knowledge of Special Mint Sets, cameo designations, and coin pricing. He had recently contributed to David W. Lange’s Guide Book of Modern United States Proof Coin Sets. We kept in touch over the years on various numismatic book projects. Then in 2008 we started talking about Franklin half dollars, and the growing collector interest in these coins, especially in high grades. Rick had already written two editions of his Complete Guide to Franklin Half Dollars, published by DLRC Press. That May, after our conversations turned toward the potential of Rick writing a book for Whitman, I envisioned him in our Bowers Series lineup. In this format his work would be published in full color in our standard six-by-nine–inch trim. I talked with Q. David Bowers (Whitman’s numismatic director) and with our sales team, studied the market and collector demand, and looked at activity in auctions and set registries. Would a book dedicated solely to Franklin half dollars be big enough for our publishing needs? Such a book would have been our first Bowers Series volume devoted to a single relatively short modern coinage series. (In 2007 we had covered Jefferson nickels, but we combined them with Buffalo nickels into a 288-page volume.) I began to wonder if we might broaden the scope of Rick’s book by including Kennedy half dollars. To gauge the strength of this idea I conducted an informal poll of 146 novice, intermediate, and advanced coin collectors. About one-third of them actively collected Kennedy half dollars—that included hobbyists who were constantly upgrading their sets, those who were filling holes in an album or folder, and enthusiasts who sought every Fivaz-Stanton die variety. Another 13 percent identified themselves as casual collectors of the coins (“Yes, I collect them, but not actively”). Another one-third said they owned some Kennedy half dollars but considered them more of an accumulation than a carefully assembled collection. And about one-quarter of the hobbyists I polled didn’t collect Kennedy half dollars at all. This information painted a picture of a coin with many passionate fans, a robust presence in the hobby community, and the potential to continue growing in popularity. We moved forward. Rick tackled the million moving parts involved in putting together a book manuscript—researching, writing, photographing coins, gathering data—and the Guide Book of Franklin and Kennedy Half Dollars debuted in December of 2010 as volume 15 in the Bowers Series. 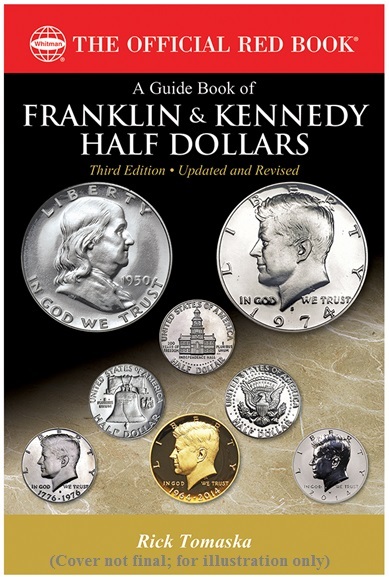 It was the first book devoted substantially to the Kennedy half dollar, while also showcasing the author’s extensive knowledge of the Franklin series. It was immediately popular in the hobby, and our inventory sold out by the end of 2011. Rick updated the book in a second edition that came out in early 2012. It went through several printings over the next five years. Since then much has happened in the world of Franklin and Kennedy half dollars. The latter coins were highlighted in William Rice’s acclaimed The Kennedy World in Medallic Art, a study of John F. Kennedy and his family in coins, tokens, medals, and other collectibles. The United States Mint issued, to great fanfare and excitement, a special gold Kennedy half dollar and several silver versions that celebrated the coin’s 50th anniversary. This brought national mainstream news coverage to the hobby. Meanwhile, collector interest has climbed for both series. The number of registry-set collections of Franklin half dollars has more than doubled since the first edition of this book was published. Auction records have continued to be broken, and numismatic research has been ongoing. The newly expanded third edition of the Guide Book of Franklin and Kennedy Half Dollars will debut in a few weeks. Rick Tomaska has updated the market commentary, the pricing, auction records, and other details about each coin. He has increased the catalog to include more recent coins, added a section on Proof Liberty Walking half dollars (precursors to the Proofs of the Franklin series), shared his definition and analysis of exceptional cameo contrast, gathered auction and private-sale records, and included new photographs. Longtime collectors will appreciate the new information in this volume, while beginning collectors will benefit from an immersion in its two very popular and historically significant coin series. As a publisher and as a numismatist, I’m pleased that Rick’s book has accomplished so much, resonated with so many collectors new and old, and taken a significant position in the body of important numismatic literature.